One of the reasons why I ran for Langley City Council is to advocate for improving the sidewalks in our community. When I’m in other municipalities, I’m always on the look out to see how they are improving sidewalks in their communities. The City of Abbotsford has been doing some impressive work over the last little bit planning for, and improving their public realm to support the creation of a walkable, livable community. Safe sidewalks are one of the indigents required to build a walkable community. McCallum Road is one of the streets in Abbotsford that is in transition. Some sections of the street have super narrow sidewalks and strip malls, but as it redevelops, it is being transformed into a walkable corridor that could support frequent transit service. 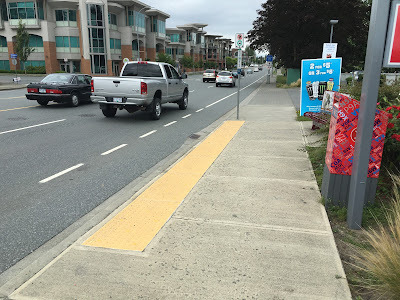 Sidewalk safety is a big deal, and I was pleased to see that Abbotsford appears to be taking sidewalk safety seriously as it redevelops McCallum Road. 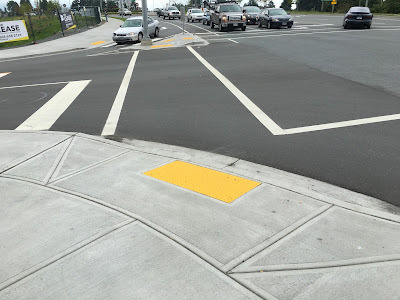 Yellow tactile walking surface installed at intersection on McCallum Road in Abbotsford. Select image to enlarge. the location of transit stops along McCallum Road in Abbotsford. Select image to enlarge. 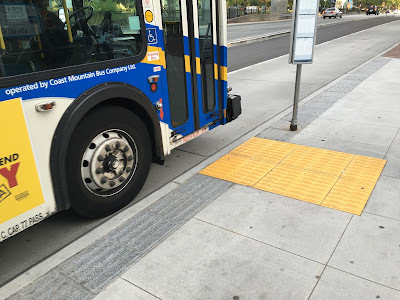 As you can see in the preceding pictures, the City of Abbotsford has installed yellow tactile walking surfaces at bus stops and intersections. This strips let people who are visually impaired know when they are leaving the sidewalk and entering the street. 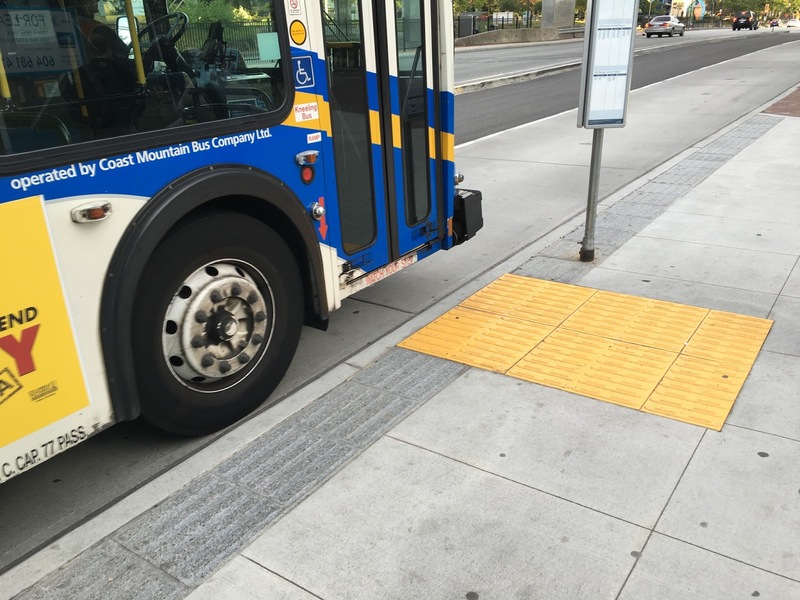 There is a great post on the Civil PDX blog which provides a detailed overview of tactile walking strips, and how they help people. These strips can also be used to provide directional guidance, and as in the case of Abbotsford, to indicate the location of transit stops. These strips also provide visual cues to both people who are driving and have full visions, and can improve overall safety for everyone. In Metro Vancouver, TransLink provides guidance on how to incorporate tactile surfaces at bus stops. Here is an example of a new transit stop at King George SkyTrain Station. Transit stop at King George SkyTrain Station in Surrey. Select image to enlarge. It would be great to see tactile walking surfaces installed at intersections and transit stops in Langley City as we rebuild our sidewalk network to improve safety for everyone.